Trail Ramblings: Who Rides In This? An article by Janine Copple Comments Off on Trail Ramblings: Who Rides In This? Answer: some of you. I’ve seen you. We were very fortunate to have had such beautiful weather to ride in over the past few weeks and most of the holiday. Many of you took advantage, because I saw ride pics. I even saw people on the trails who looked like they hadn’t been on a bike since summer and had ventured out to revel in the alignment of time off with good weather. I got a couple of decent rides in over the last couple of weeks, but a week ago I was too busy to even post. So it goes, when one finally has the time, one doesn’t have the weather. Unfortunately right now the trails are not very rideable, according to what I’ve heard. The rain before the snow means the ice is not going to come off so easily. This brings me back to the current question. So who has studded tires? I have been on the fence about them for years, I’ve managed with my old winter mountain bike until now but I might really get some this year. The side streets are predictably horrible, but the 13th street bike path is unexpectedly good for cycling in snow and ice. Being more used, it was mainly free of ice and was much better than 11th. The new 13th street bike path. Snow plows had pushed the snow off the bike lanes, though there were a few patches. 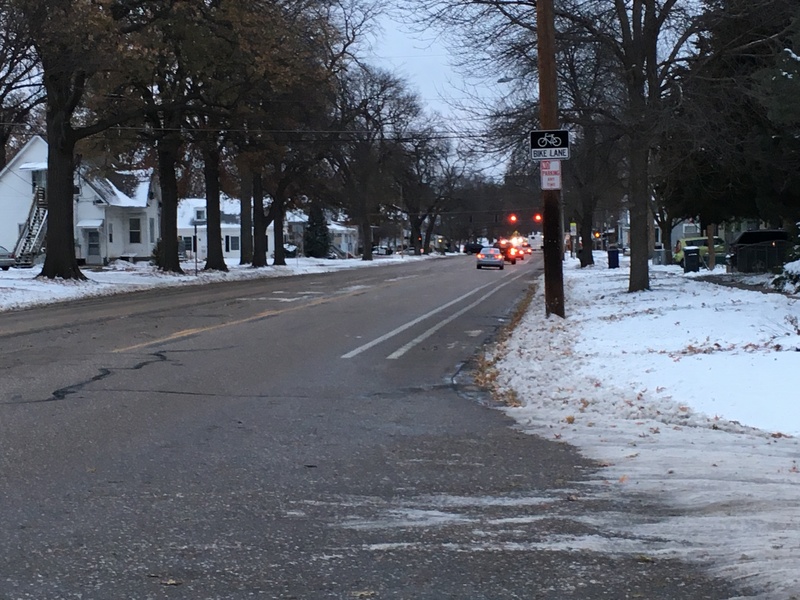 Where there are side paths, such as along Pine Lake, plows tend to push the snow onto them, making the side paths impassable, but on the street, the bike lane was clear. 11th Street. 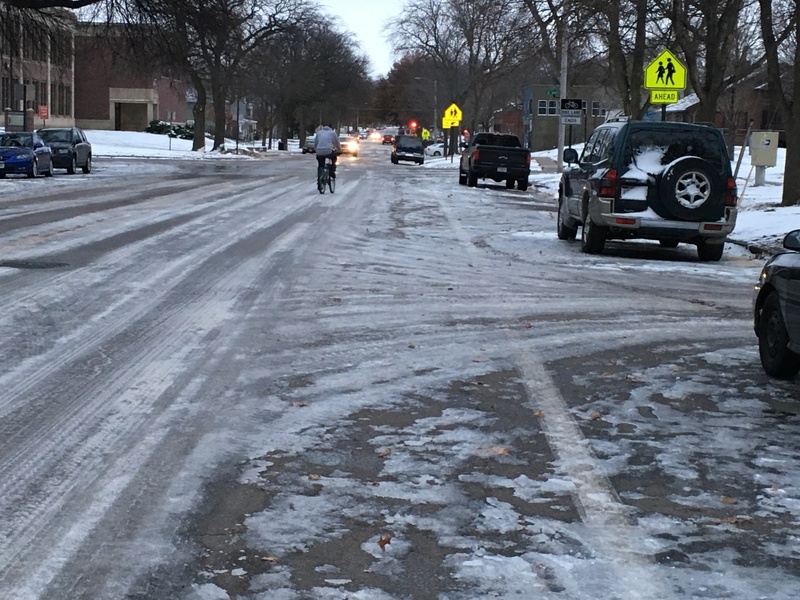 This bike lane is not as safe as the13th lane in the ice. I’ve read the debates, carbide tips are worth it for lasting more than one season. Yes they are expensive. I’ve come close to making my own studded tires. There are directions on YouTube. Here is what one expert says about them. (I’m not endorsing any particular brands) If you want to read it you’ll just have to go there, as it wouldn’t link. “To describe the stud’s effectiveness, I’ll use an analogy. Think about walking with rubber soled shoes on three surfaces; dry clean asphalt, glare ice, and glare ice that’s been sprinkled with sand. On the dry asphalt you can run and make sharp turns without any concern about your shoes skidding. On the ice, you can only walk carefully, changing direction and speed slowly, lest you Fall Down Go Boom (that’s FDGB for those of you, “in the know” so to speak). On ice that someone has nicely sprinkled some sand over, you can walk easily and perhaps even run. 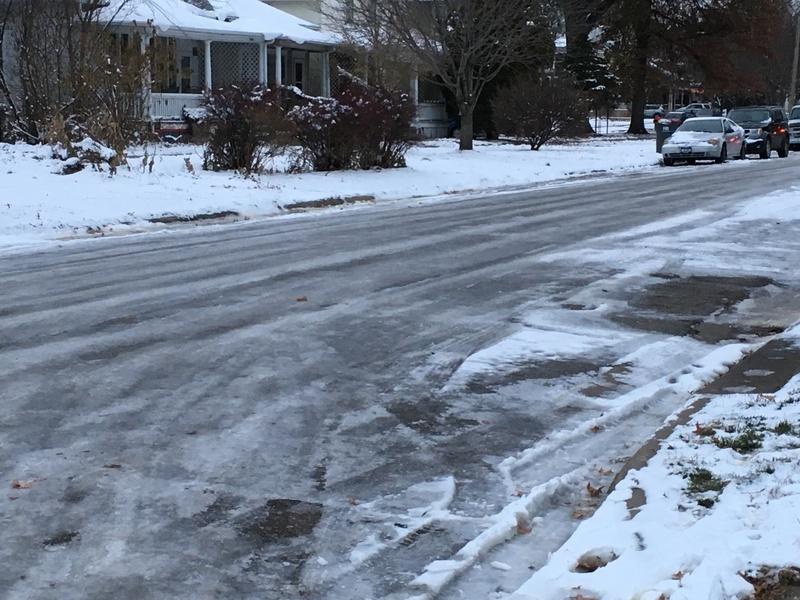 But if you do run you won’t be making any sharp turns or trying to stop quickly, as you would on dry asphalt, since you know full well that those little grains of sand aren’t glued onto the ice, and can roll if pushed hard enough”. He also talks about various attributes of the tires, studs, etc. and not the brake with the front tire on ice and snow. So I may well be shopping for studded tires for the old mountain bike. It will make these conditions more enjoyable and much safer.